This Is The Beautiful Miami Deco Diner Booth. Set is comprised of two 44″ benches upholstered with a contrasting middle channel and piping. You may choose the color of the seat, back, channel and Piping from a wide assortment of standard colors. You may also choose from our premium Zodiac, Cracked Ice, or Sparkle vinyls. 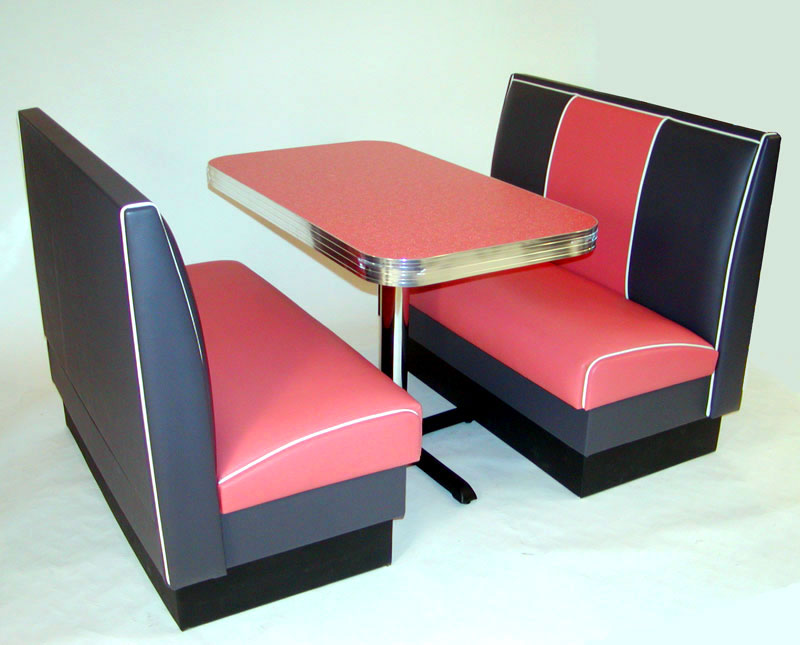 The Miami Deco Diner Booth Set includes a 24″ x 42″ inch table, fabricated in Boomerang Laminate with 1 1/4″, 2 1/4″, or our exclusive 3″ groovy insert metal banding Completing the set is a Classic or Premium Chrome Column Base. The minimum required spacing for one of our traditional booths is 44 inches by 5.5 feet. If you like this model, we also offer the Miami Deco Diner Booth in a quarter circle, a half-circle, or an “L” Shape configuration with complementing table and base. Please send an email or call 304-728-0547 and ask to speak with one of our booth specialists. Let us offer our expertise in assisting you create a set that is perfect for you! Priced at only $1495! Questions? Send us an email, use our CHAT feature, or call 304-728-0547 and one of our retro specialists will respond right away. We offer a great commercial customer discount when ordering in large quantities. Let us help you build your diner or retro restaurant. Please allow 4-5 weeks for production of the Deco Booth Series.